Great week at Appin Holiday Homes. Julie and Jim were very helpful and friendly. Absolutely stunning location with lots to do. Pub very close by. Ideal holiday for a family with a dog. Had a great weekend staying in Appin holiday lodge with our dog. Really cosy and comfortable. Lots of nice walks nearby and dinner at the creagan inn down the road was fantastic. As always excellent stay at Appin Holiday homes. The accommodation was spotless the customer service fantastic and the views unbeatable. Fantastic as always! Friendly and helpful family business, look forward to coming back. Beautiful location. A nice location for a family. For the kids a little playground. There is a gameroom but the pooltable is broken and the dvd’s and Xbox-games are useless without a player. Some caravans have dishwasher and dvdplayer, but not all. The matrasses are poor quality, so backproblems for grownups. Kitchen looks beautifull en is full equipt. Nice veranda for the evenings. We had a lovely weeks holiday in a cabin with a fantastic view of the loch. The owners were friendly and very helpful. A short walk down to the Creagan Arms where the food was excellent and we'll priced. The weather was good to us and we were able to sit and eat outside and watch the sun go down. We would go back again and would recommend it as a great stay. Love the place. Return every year for Christmas and New Year, and Appin Holiday Home always provide the perfect retreat. Great stay at appin will be returning next year. Excellent and friendly owners very helpful. Great facilities. Our stay at Appin holiday homes was really wonderfull! The location, the owners, Jim and Julie, the stunning view, just amazing! Just returned from a weeks stay in oak tree lodge. Couldn't fault it. The lodge had everything we needed. Beautiful setting with Fantastic views, lovely walks, 2 mins to the loch for the dogs early morning swim, 10 mins walk to the lovely Restaurant. Only slight downside is no wifi in the lodge but we knew this before booking. Would definitely recommend a stay at Appin holiday homes. Comfortable furnishings and everything worked perfectly with the exception of the wi-fi. Nobody to greet us at the appointed time but to be fair I think that that was the fault of Booking.com not relaying my message quick enough. Some refurbishment had been carried out but the bathroom needs updating but is fully functional. Lovely view over the lock and a good pub is nearby which serves excellent meals. Unfortunately the WiFi was not in the lodge so disappointed in booking.com yet again. The lodge was good otherwise. Very friendly owners who helped us by the hot water. We didn't know how it worked. Very nicely situated and comfortable holiday home. Not far from Oban and Island of Mull. Thanks so much for the fab review we are so glad you enjoyed your stay with us. Appin Holiday Homes is an excellent base to explore the surrounding areas including Oban and Fort William. Endless walking and cycling opportunities are on your door step. The view of the Loch from our lodge was priceless. The lodge itself was comfortable and excellent value for money. The Creagan Inn is a ten minute walk and we enjoyed dinner there a couple of times. Port Appin, a short drive also has excellent dining options if you want a break from cooking. If you want the get away from it all but like a choice of options a short drive away then this is the perfect base for a break in the Highlands. It was an excellent place for taking a break from hectic days, nice panoramic, excellent ambiences. The lodge was comfortable with complete facilities (cookery, TV, and DVD). It would be helpful if there is a wifi services. I suggested to provide a towel and napkins. We hope can stay there again. We had a fantastic week in Oak Tree Lodge over the New Year period. We had great views of the loch and surrounding countryside. Jim was very friendly and helpful. We'll definitely be back at some point. The Lodge was all clean when we arrived and we were looking forward to our stay. Unfortuately none of the beds were comfortable or felt very secure. There was a lack of various items in the lodge that I would have expected to see - no tea towels, no bath mat, no small plates, no sensible sized frying pan, in fact the kitchen cupboards were very empty for a self catering property. The cooker was not fit for purpose - could not read the dials it was so old, certainly couldnt use the oven no marks on the dial at all so didnt know if it was off or on. Great location the property just needs some investment to bring it up to expectation based on the price ! Excellent local to get around we visited Oban over to mull . Annoch moore and Fortwilliam . Excellent views . Would have liked to have wifi in lodges only at a central point in games room . Excellent location with very welcoming hosts. Myself and my partner along with our eight year old daughter will in all probability return to this accommodation when we next venture up to the Highlands. Lodge very clean and comfortable,location excellent,loved the old station and local pub ,didn't get to meet the owner this time and trying to get a clothes airer took sometime.would definitely recommend this park. Excellent location. Wonderful views, well equipped, clean lodge. Incredible surrounding. We also managed to spot eagle once or twice. Only criticism is frying pan was missing which is very essential in kitchen. The log cabin was ok but in need of a lick of paint in the main living area, however the views were amazing and Jim the owner was very friendly and welcoming. A weekend break at the Oak Tree lodge. First off I have to comment on the location. Apart from being a beautiful, scenic part of the country the lodges are situated beside an abandoned railway station that is being restored by volunteers. This adds an interesting aspect to your experience there thanks to the railway buildings that are open to exploration. The track bed is now a miles long path, ideal for long walks with the dog. Dogs will love the space to run around and our children loved the rope swings, the outdoor giant chess board and chess pieces and the freedom that this safe location gives them. It was handy for exploring the area around and we used it as a base for trips to Oban, Fort William and the sea life center nearby. The owners are friendly and super helpful. Lovely people. All in all it was a great weekend break. We are glad you made the most of your stay and did plenty of exploring. We are hoping to tidy up the old station area further to make it even more pleasant. Glad the kids made use of the chess set and rope swings! Had a wonderful, relaxing week staying in Appin Lodges. The lodges were clean and tidy with plenty of room for the 4 of us plus a little dog. Excellent views across the Loch and within easy access of Oban, Fort William etc. Thank you for the lovely review and for your recommendation. Excellent location, very friendly and helpful owners, property very well maintained and equipped. This property enjoys superb views over Loch Creran and is just a short walk from the Creagan Inn which provides excellent food and beverage services all day. The property is within easy driving distance of Oban and set in an ideal position on the Caledonian way for both cycling (Route 78) and walking enthusiasts. Would also recommend the Pier House Restaurant at Port Appin for a very special meal experience. A most welcoming, enjoyable and comfortable stay hope to return. The place was lovely, with great views to the loch, very spacious, clean and cozy. We all loved it! Jim (the owner) was also very nice and made everything so easy, so I would absolutely come back! We had a great weekend stay, the owner Jim was there to welcome us in, very friendly and professional! Oak tree lodge was lovely, clean and had plenty of room for a family of four! My two young boys aged 6 & 2 had a blast! We had a very pleasant stay. We can recommend it to anybody who loves spending quiet holidays. No matter what the weather is like, you can spend there a very relaxing time and charge the batteries. Jim came and introduced himself when we arrived which was a bit later than anticipated due to hire car issues. He was very friendly and made sure we were comfortable and had everything we needed. The cottage was great and very well equipped with everything necessary. The beds and pillows were very cof or table and cosy. The cottage is in a lovely location and the grounds are lovely with large scale chess and draughts and a games room with pool table and books. WiFi was available around the games room area but that was fine and the does state in the info on booking that it's only available in public area. Wished we had more time as we would have definitely stayed longer. Brilliant would stay again and recommend to people great location and ran great . Accomodation was excellent and the owners were helpful in person and on telephone before I stayed . Top marks for everything excepting the customer service, only because we were left alone to enjoy our time at the wee lodge, and for the location. We had an amazing view of Loch Creran but unfortunately there was a road between us and the sea which we were not aware of when booking. When inside the lodge, we were not affected by this as the sound proofing was very good. The lodge was kitted out beautifully. Everything we needed was there. We cooked some meals and there was hot water whenever we needed and a full working kitchen. Thank you for a lovely stay, Appin holiday homes, we will return again during the summer months... we thoroughly enjoyed the nearby forest walks and along the shoreline, also the holiday park's surrounds in their autumn splendour. A really nice place, wish I was still there and had more time to explore the locality. The owners are lovely people and it was really good value for money. Ideal for exploring the area by car with Fort William and Oban within driving distance, the bicycle track is right on your door step, lots of good walks and the loch is great for getting out kayaking on, which is full of seals and wild life. everything was so perfect , nice and peaceful and quite just what the doctor orderd. Very nice scenery. Plenty of wild life and the lodge was very comfortable and very clean. We were very pleased with the lodge. 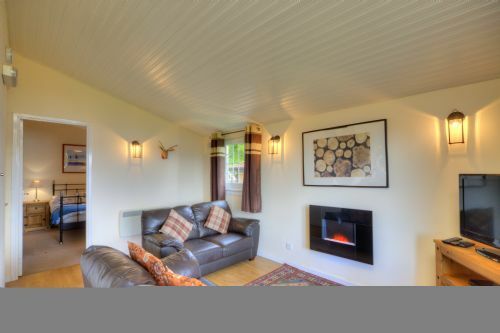 It is beautifully located looking over the loch and the lodge itself was clean and modern inside with leather sofas, flat screen tv and comfy bed. The location was great being between Oban and Fort William. The wifi in the games room was handy and we enjoyed playing giant chess in the evenings after a nice day exploring the west coast. We look forward to coming back again! Great location,views and good local pub serving good food. Easy access to good places to visit.